Jack be nimble, Jack be quick. 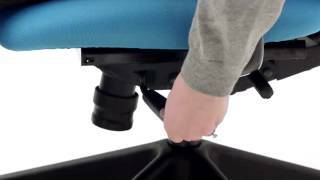 The Steelcase Jack Task Chair TS303 is the ergonomic chair of your dreams, and it's going to change the way you sit. Highly adjustable and ready to cushion your body in all the right places, the Jack Task Chair by Steelcase is an affordable all-day use office chair that's there for you when you need it. Never hunch or strain again with this agile addition, thanks to the contoured seat and seat back and swiveling mechanism to keep you seated in the best positions for your body. The yellow is a beautiful golden rod color. Good looking and clean appearance. It was easy to put together and is very comfortable. Perfect size for my 5 foot 1 inch height. $283.00 List Price: $475.00* The list price is the same as the MSRP (Manufacturer's Suggested Retail Price). It may not necessarily be the price at which the product is sold.